I love organizational products! I have a large family and my house would be a wreck without them. I look for storage containers of all types and even try some creative ideas out. 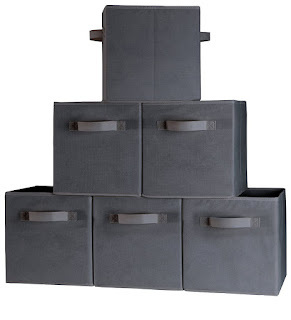 Foldable Cube Storage Container-Set of 6 Dark Gray is a great storage system. The gray is a nice neutral color and these cubes fit in about any of the shelving units made for storage cubes. They can be used in any room and go with just about any decor. I love a product that keeps clutter and collections out of view. They are great in an office, bedroom, bathroom, living room, family room, even the kitchen. I wouldn't mind having a set of these in each room in my house. Being organized just makes my day feel like it goes smoother. I rece ived this product for free in exchange for an honest unbiased review.